The Blackpool Zoo Miniature Railway first opened in 1972. Trains run from Dodge City to Wells Fargo for 700 yards within Blackpool Zoo. 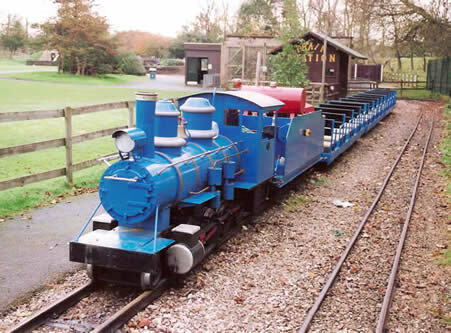 Originally two 'Rio Grande' steam outlines built by Severn Lamb operated here, but the later build has since moved to the Oakwood Miniature Railway in Wales. Trains are now worked by the older Rio, hauling four Severn Lamb open coaches. Fares: Adults £14.99, Concessions £12.99, Children £10.75 Entry Fee. Extra for train. BZMR Page was last updated on the 1st January 2011 with fares updated.